Have you ever stopped to ponder why it is that, when the world attempts to portray what it would look like for the supernatural world to intersect with the natural world, the things they come up with are most often frightening and perverted in some way? Many examples of this come to mind: werewolves, vampires, Frankenstein, zombies, aliens, mummies, and so on. The human mind seems predisposed to think of the supernatural in a way that is scary, frightening, and most often a horrific perversion of what is normal and natural. From a Christian perspective, though, doesn't it make sense that the natural, unregenerated mind - in its sin-darkened state - can only conjure up a darker, more frightening version of what it "knows" (humans and human-ess) when attempting to make sense of the world? After all, the Bible tells us that man is darkened in his understanding, his wisdom is foolishness. The truth is that, without benefit of the special revelation of God's Word, the Bible, the human view of that which is supernatural seems to default to the freakish and the frightening. But what does it really look like for God to enter into time and space, and intersect with the natural world by taking on flesh and dwelling among us? God, our omniscient, omnipotent, sovereign Creator, chose to enter into our world as.....what? As a magnificent archangel, so that everyone would know how glorious He was? No. Well, then, perhaps as a mighty king, as a sort of preview of Christ's eternal kingdom to come? No. 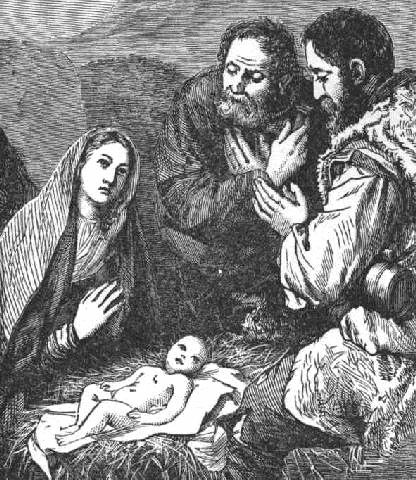 God's own Son, God in flesh, entered into our world as a baby. A tiny baby, born to a poor carpenter and his betrothed, tucked away in a small town that was considered insignificant. Let's first consider the fact that Jesus was even able to be born, live among us, and interact with throngs of people during his ministry in a way that wasn't, well, frightening. Think about it. Of all the supernatural beings ever imagined or conjured up in the imagination of man, Jesus was the most supernatural of all supernatural beings ever to walk among us. How was it possible that he even could walk among us without people falling to the ground in abject terror over his glory? How could people be in his presence without being consumed? How could a mere mortal - Mary - carry him in her body? There are glimpses of his glory and magnificence throughout the gospels: most notably, his miracles, Peter recognizing his Lordship and falling at his feet on the fishing boat, his transfiguration, his power over nature, his resurrection. Among other things, I was a practicing Hindu before God saved me. I actually ventured into a number of different religions and religious practices before being saved, but Hinduism seemed to make the most sense to me. And even though I had very profound mystical experiences as a Hindu, I can't say that the God I wanted so desperately to reach and connect with ever felt near. For me as a Hindu, "God" was remote, inaccessible, impersonal. The idea of God "coming near" was too much for my mind to grasp. What great love, then, had God the Father that He would make a way for Jesus to dwell among us. And not only did Jesus, the most supernatural being ever to step foot on this earth, dwell among us, but He wasn't frightening. He wasn't grotesque or strange or freaky or odd, and His face didn't throw off beams of light (contrary to what the carol "Silent Night" claims). In Jesus, God came near in an immensely personal way. He was born as a baby, who grew to be a man. He entered into the mire of our human existence by becoming one of us, fully experiencing life as a human, suffering pain and sadness and temptation just as we do. But why? Why did God come near? What great, good news this is! This is the message of Jesus and Christmas and the Nativity and the Cross. God came near. God made a way for sinful, wretched men to be reconciled to a high and holy God.